The great 2017 GOP tax cut swindle reduced the nominal corporate rate from 35 – 21% – the lowest US percentage since 1940 at the onset of WW II. Corporations in America don’t pay the nominal rate. Most pay little more than one-third that amount or less. Some corporate giants pay little or get rebates despite earning profits. The corporate share of federal taxes has been falling for decades. They’ve paid no taxes on trillions of dollars stashed in offshore subsidiaries and tax havens, the precise number unknown because it’s not reported. Wealthy individuals do the same thing to avoid taxes. Various other schemes are used by corporate predators and high-net worth individuals to pay minimum or no taxes. The great GOP tax cut swindle made it easier for them to shift much of the tax burden from them to ordinary Americans struggling to get by. Corporate tax cuts don’t create jobs or stimulate economic growth, as falsely touted. Corporate predators largely use their windfall for greater executive pay and bonuses, increased stock buybacks, along with extra funds for mergers and acquisitions, not pay raises or increased benefits for workers. Tax cuts putting more money in the pockets of ordinary people are stimulative. When they have more money they spend it. 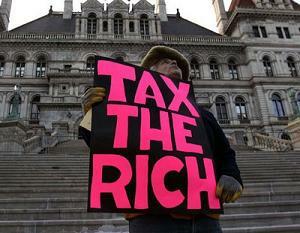 Super-rich ones use tax windfalls for investments to gain greater wealth. The Trump regime and GOP-controlled Congress took a giant step last year toward more greatly shifting the nation’s tax burden to ordinary Americans – accelerating the unprecedented transfer of wealth from them to corporate predators and high-net worth individuals. Corporate tax revenues plummeted to the lowest amount in modern times. GDP growth since last year’s GOP tax cut heist “has been unremarkable…as measured by real GDP,” not inflated or manipulated numbers. Inflation-adjusted wage growth “stagnated” post-cuts. Low unemployment is pure fantasy, underemployment affecting most US workers unreported officially and by media – my comments, not ATF’s. “No evidence of an investment boom since the tax cuts” exists. In 2014, federal corporate tax revenues exceeded $450 billion. In 2018, they’re on track to be around $250 or less – while the federal deficit soars. In the 1950s, about one-third of federal revenues came from corporate taxes. Before last year’s tax cut swindle, US corporations contributed only around 10% to federal tax collections. Now it’s little more than half that amout. Economist Ludvig Weir believes corporations in many countries will avoid taxes entirely “in 10 to 20 years at (the current) rate” of reducing their tax burden – shifting it more greatly to ordinary people while cutting social spending en route to eliminating it altogether the way things are heading. The Trump regime and GOP congressional leaders lied, claiming tax cuts would stimulate greater economic growth and jobs creation. Increased annual federal deficits alone were achieved, along with accelerating the great wealth transfer heist from ordinary Americans to privileged ones – thirdworldizing the nation more than already.